Enjoy the Chinese New Year Parade and the Fireworks! The Chinese New Year Twilight Parade, on February 21, Sunday, is one of the highlights of the Chinese New Year Festival in Sydney. This is a parade of all that is beautiful, adventurous, spectacular, delish and Chinese. Quaint, charming lanterns. Flashy, brilliant colours. Dazzling, whirling skirts. Stilt walking, acrobatics and kung fu. Breath-takingly magnificent floats. Appetising, tempting flavours. And much, much more! The Parade will conclude with a spectacular bang, quite literally, at Cockle Bay, Darling Harbour. The dazzling fireworks at Cockle Bay will light up the bay, throwing an array of colours on the harbour, displaying the beauty of the harbour in different hues! Enjoy the music, the dances and the martial art performances! Wonder at the stupendous costumes! Marvel at the amazing floats! Glare back into the eyes of the giant. Tiger on the prowl that represents this New Year’s Chinese zodiac! Thrill to the spectacle of the brilliant fireworks! As always, the harbour will be the nerve centre of all twilight, evening and night celebrations in Sydney! To make the most of the harbour, enjoy a Sydney Harbour Dinner Cruise ! Dining on a harbour cruise is one of the best attractions of Sydney and an iconic experience in itself! Come weekends, the Sydney markets are alive and bustling with shoppers hunting for souvenirs, antiques, crafts and jewellery as well as clothes, books, footwear and whatnot! The markets of the Rocks, Surry Hills, Rozelle, Bondi, Paddington, Glebe and Balmain are vibrant with its vast array of wares that include the special and the funky, the quirky and the odd, the casual and the ceremonial, the conventional and the bizarre…You name it, Sydney has it! 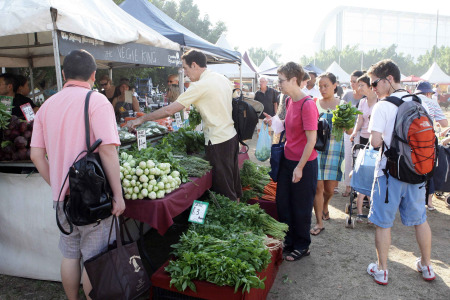 Recycled and handmade goods are the specialty of Surry Hills and Rozelle Markets. There are priceless varieties of these goods to choose from. Some of these stalls offer second-hand but exclusive stuff at steal-away prices! Shoppers are constantly baffled by the dilemma of choosing between designs of the morrow and the reigning labels of today! The delightful ethnic collections at the night markets of Chinatown have been a constant source of attraction for visitors. In fact these markets are a fair reflection of the attitude, lifestyle, culture, and aesthetics of the people of Sydney!